Donald Trump visited a Black history museum and gave lip service to healing the racial divide. But racial animus is what he is about, and there is not a reset coming. We are being told by the corporate media and Donald Trump’s fellow Republicans that some sort of reset in his posture towards the Black community is in the works. This time, the comments came after Trump visited the National Museum of African American History and Culture along the National Mall in Washington. In prepared remarks, Trump said, "We're going to bring this country together. We have a divided country that's been divided for many, many years, but we're going to bring it together." He is the worst ambassador for such a unifying message. During the presidential campaign, countless stories were written about Trump supposedly "pivoting" towards a more acceptable and dignified tone, first when he accepted the nomination, and then after he became president. The pivot never came, nor will this reset. Trump has consistently and repeatedly made denigrating comments and "jokes" about Black people, while at the same time giving a wink and nod to white supremacists and other hate groups. His decision to appoint white nationalist Steve Bannon to be his top adviser is perhaps the clearest sign that he has no interest in pivoting from the racial animosity he stoked to win the presidency. But let's start with his history. In 1973, Trump and his company were sued for housing discrimination by the Justice Department. Testers had been sent to Trump management seeking apartments, and Blacks were told that there was no housing available, while whites in similar economic standing were told that they could move in. Trump settled the lawsuit without admitting guilt. 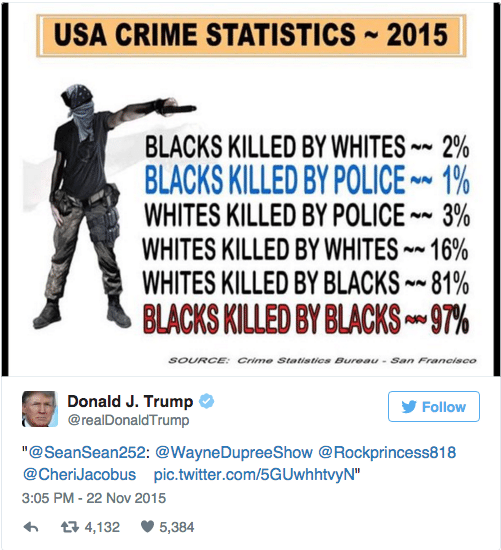 Also during the campaign, Trump retweeted a white supremacist graphic that misled on how often murders are committed by various ethnic groups, citing a fake government agency. And his presidential campaign, including his son Donald Jr., repeatedly courted the support of white supremacist groups and invited them to broadcast from campaign events and gave them access to campaign officials. Former KKK leader and active racist David Duke endorsed Trump, and he had to be dragged kicking and screaming to tepidly reject Duke’s support. Duke still cheers on Trump for his anti-Muslim and anti-immigrant policies, by the way. Trump "joked" about the lead poisoning the water in Flint, Michigan, that has disproportionately affected the lives of Black children. 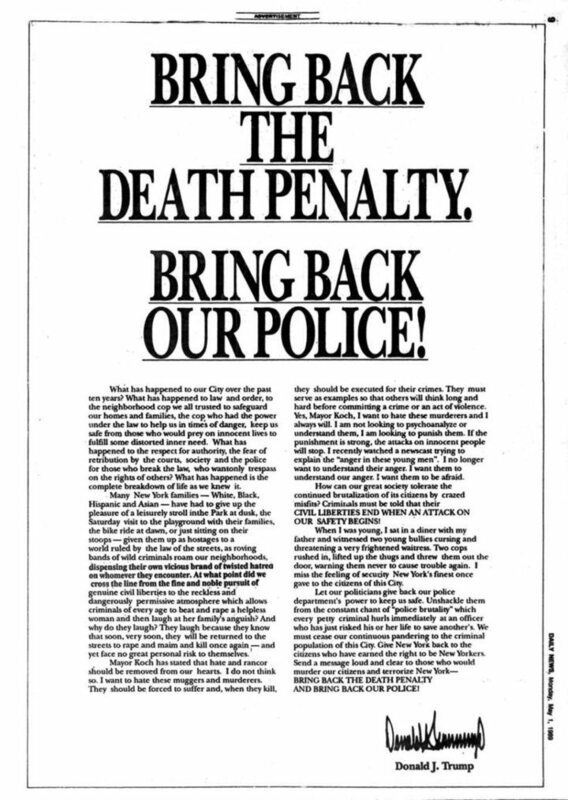 TRUMP: It used to be — think of this, is this true? It used to be, cars were made in Flint, and you couldn't drink the water in Mexico. Now, the cars are made in Mexico, and you can't drink the water in Flint. [cheering] Oh, I hate to say that, but it's true, it's true, it's true. And I can say that to you folks. Trump referred to a Black attendee at one of his campaign rallies as "my African-American." TRUMP: Oh, look at my African-American over there. Look at him. Are you the greatest? Do you know what I’m talking about? Okay. Since winning, Trump has not pivoted from this type of behavior. Trump kicked off Martin Luther King day weekend by attacking civil rights icon Rep. John Lewis. Whenever he refers to minorities or minority communities, Trump seems incapable of understanding that they don't all live in cities, and even those that do are unlikely to live in a bombed out slum reminiscent of portrayals from the late 1970s and early 1980s. Despite a drop in crime in Lewis' district, Trump reacted to criticism by describing Georgia’s 5th District as "falling apart" and "crime infested." He also said Lewis was "all talk" and "no action," ignoring Lewis' role getting beaten on Bloody Sunday while fighting for equal rights. Indulging in his habit of watching too much cable news, Trump reacted to a segment from Bill O'Reilly on Fox News, by tweeting that he would "send in the feds" to fix the "horrible carnage" in Chicago. Fox has repeatedly used "Chicago" as a dog whistle to bring up race and violence, particularly since it was President Obama's home city. In a recent press conference, Trump was asked by April Ryan of American Urban Radio Networks why he had not met with the Congressional Black Caucus (CBC). At first appearing not to know what the CBC is, Trump then asked Ryan, a working journalist, if she could set up a meeting between him and the group. This appeared to be based on the assumption that since she is Black, they must all know each other. TRUMP: Well, I would. I tell you what, do you want to set up the meeting? Do you want to set up the meeting? RYAN: I hear he wanted that meeting with you as well. TRUMP: He wanted it, but we called, called, called, called, they can’t make a meeting with him. Every day I walk in and I said, ‘I would like to meet with him,’ because I do want to solve the problem. But he probably was told by Schumer or somebody like that, some other lightweight, he was probably told, he was probably told, ‘Don’t meet with Trump, it’s bad politics,’ and that’s part of the problem in this country. When Trump held a Black History event at the White House, he stacked it with Black members of his administration and political supporters, even though the vast majority of Black voters in the election supported Hillary Clinton (88 percent to 8 percent for Trump). And he spoke about his election victory and griped about the press, rather than discuss Black history or achievement. Trump's White House advisers are figures with ties to white nationalism. Top adviser Steve Bannon ran Breitbart News, the so-called "platform of the alt-right" that has engaged in white nationalism and published racist hate material. Trump is also advised by Kansas Secretary of State Kris Kobach, who served as a lawyer for the legal arm of the anti-immigrant Federation for American Immigration Reform (FAIR), classified by the Southern Poverty Law Center as a hate group. His chosen Attorney General, Jeff Sessions, gave keynote speeches to FAIR and has been a regular attendee at their conferences. This is not the behavior of someone remotely interested in a reset, turning the page, or pivoting from racist rhetoric or behavior or supporting those who engage in the same. Trump is who he has always been, and a visit to a museum is not going to change that.